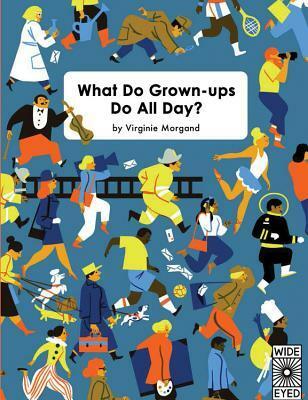 Title : What Do Grown-ups Do All Day? I won this book through a Goodreads giveaway. I'm trying to get through all of the books I've won:) I'm making progress. My son and I went through 2 scenarios a night until we were done. He's 7 and a pretty good reader for his age. There were some words that challenged him, which I liked and words that he sounded out, which made me proud as well. He got to read about what his daddy does on a construction site. So, that was neat! I think this book was very informative and gave information on a lot of careers I wouldn't have thought to describe. An introductory of different grown up jobs at best. Includes professions kids might already be familiar with. Decent art. Simple explanation about hundred of jobs so it can help children imagine what they want to be when they grow up. Around fifty different occupations are described in short sentences. Digitally illustrated. Lovely. I received this book free through Goodreads giveaways.I really enjoyed this book and I think its perfect for all children. I love the illustrations they are so simple and old-timey. I love how they aren't trying to be super hip/modern. This book reminds me of the Richard Scary books I had as a kid. It shows a picture of a job and a couple sentences explaining what the person does. What I love most about this book is the diversity. The illustrations show people of different races and genders in all types of jobs and does not limit jobs to being race or gender specific. Ex. The Engineer looks to be a hispanic woman. I know I immediately looked up teacher and police officer (my husband and mine jobs) and I know children would love to learn about their parents jobs! I am so torn about this book! I loved it, first of all. The illustrations are simple and it definitely describes to students about different types of careers and the skills needed for each. I am definitely keeping this book for my daughter, but I am not sure about how it could be used for social studies. I have issues with this type of thing being social studies content, but I may have to reconcile this. I do think this would be a great addition to any lower elementary classroom. It's about grown-ups doing jobs. When you read it, you can pick what job you want to have.